I was so excited to get the latest Old Lady book in the mail from the sweetest reader, Diane! It arrived at the best time, too, just right before school started! 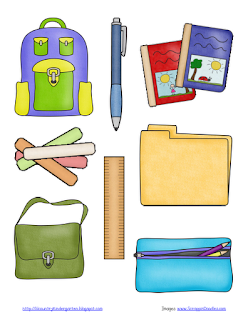 It is perfect book for back to school! 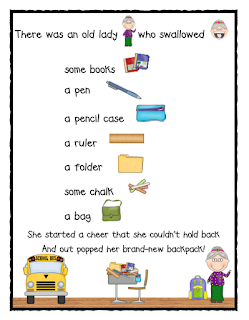 Thanks again, Diane, for sending me a copy of There Was an Old Lady Who Swallowed Some Books by Lucille Colandro! 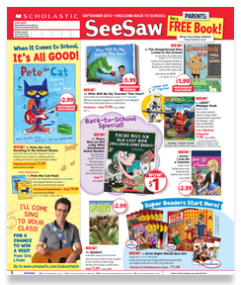 If you haven't purchased a copy yet, it is only $1 in the Scholastic Book Clubs SeeSaw September flyer. That is an amazing price! 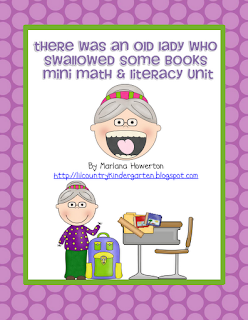 Click on any of the pictures below to check out my newest unit There Was an Old Lady Who Swallowed Some Books Mini Math and Literacy Unit on TpT. It is only $3 and is the same style as my other units for the Old Lady series of books. 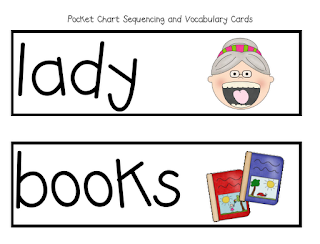 Here are a few sample views for you to get an idea of a few of the pages included. The first three people to comment on this post with their email addresses, will receive a copy of this unit for free! Thanks for being such great readers! Thanks to the first three who commented! Looks great! And the book is on my list to order from Scholastic. Awesome! I LOVE Lucille Colandro! I haven't checked out my scholastic fliers yet but am going to right now!!! Am I a winner? It looks like a great unit! I just ordered this book with my kids' book order. I'll check it out. Thanks!!! This looks great! I don't think I have read any of the old lady books. I think I should start reading them with my daughter. Super!! What a great series of books! I will be ordering my copy for sure!